Letters and comments may be edited for space. Email us at lovenotes@portlandmercury.com. It’s the shameful open secret of our industry: Journalism is kind of a boys’ club. Since 2009, VIDA: Women in Literary Arts has tracked the gender breakdown of bylines in major publications as well as lesser known literary outlets, and what they’ve found is damning: Very few of the surveyed publications are hitting a 50-50 split when it comes to the gender breakdown of their bylines. In VIDA’s most recent count from 2015, only about 30 percent of the Nation’s bylines belonged to women. At the New Yorker, it was about 34 percent. Harper’s and the New Republic barely broke 40 percent. Unsurprisingly, the numbers are even worse when it comes to racial diversity and sexual identity. This is happening at some of the country’s most well known national print media outlets, so you know it’s also happening at those with fewer resources to recruit and compensate writers. That’s a problem if you care about gender equality, but it’s also a problem if you care about good journalism, because if a publication isn’t staffed with a variety of voices, its reporting and criticism will be weaker, less comprehensive, and less nuanced. It will have blind spots. In a precarious, politically corrupt era when quality journalism is needed more urgently than ever, this is something we can’t afford to perpetuate. So we’re doing something about it, in solidarity with those taking part in A Day Without a Woman, the women whose invisible labor powers our country, and the women who power our newspaper. From the account executives who sell print ads, to the copy chief who proofreads and fact-checks each piece of writing that goes in the paper every week, to the art director who chooses what goes on the cover, the Mercury is an operation that very much depends on the labor of women. You may not always see this labor week to week—not all of what I’ve just described is visible to a casual reader—but if we didn’t have women on our staff, we wouldn’t have a newspaper, full stop. So this week, we’re making women’s work visible in the most obvious way we know: Every single piece in this issue of the Mercury—from Elinor Jones’ feature on repurposed airplane living to the shortest film review to I, Anonymous and the jokey columns you know and love—was written by a woman or nonbinary writer. 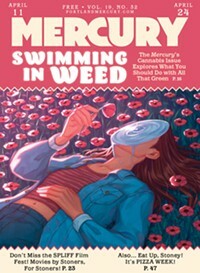 And every single piece of accompanying art in this issue of the Mercury—from our logo to the comics and the photographs—was made by a woman or nonbinary artist or designer. We don’t present this as a wide-ranging solution to our industry’s problem—it’s not. But if we can do this, other outlets can too. And bigger outlets have no excuse. Your move.